Audiences seem to love watching untold stories come to life. Tales about people or characters or history they know. Like what happened before the girl from Kansas dropped in or the events surrounding the signing of the Declaration of Independence. Audiences eat it up because they feel a part of the inside story. So taking history and giving it the musical treatment is nothing new. But finding the right story to share, now that’s the trick. In the new musical Madame Infamy, transatlantic history is given the rock treatment in the 18th century. American history and European history are often never discussed in the same breath. Meaning the timeline of events for both are usually presented individually, or at least when it doesn’t directly involve America. In Madame Infamy, we are presented a grand opportunity to see two crucial moments in history that are never paired together; American slavery and the French Revolution. The duality of the stories are engaging as we follow the lives of two strong female presences, Sally Hemings and Marie Antoinette, tracking their history, how they are seen and will be remembered. In order to present these two tales together, a connection needed to be made. That connection is through infamous wax sculptor, Madade Tussaud. By chance, these two woman happened to be in Paris at the same moment via Tussaud, and though they may not have ever interacted, Madame Infamy book writer JP Vigliotti gives us the what if and his own take on history. While presenting history in dramatic form it’s almost inevitable that liberties will be taken. Not all fact is dramatically exciting or useful in sharing a story, so fudging the truths will happen. But hey, it’s not like it hasn’t been done before (Bloody Bloody anyone?). Vigliotti took bold liberties with the timeline of both stories in order to make them fit dramatically together. While most audiences will forgive this, the history buffs will know that mere years make a big difference. Sure, in reality there is about a seventeen year gap between Marie Antoinette’s rise to power after marrying Louis and Sally Hemings’ journey to stay with Thomas Jefferson, but by presenting them simultaneously, the dramatic through-line is fulfilled. But by the end when Jefferson dies, leaving Hemings as property, Marie Antoinette's head had been long gone. But again, if Madame Tussaud is the link for the two stories, then she needed to be more present to further sculpt these worlds together. Tussaud starts and ends the play as the focal point but often disappears to give Sally and Marie Antoinette the focus. With two very intriguing stories, there is too much material for one musical, often resulting in one-dimensional characters. Beyond the book, the overall musical scape by Cardozie Jones and Sean Willis is beautiful with some really great numbers. But in the world of historical pop rock musicals, there were some moments that felt derivative to pieces like Elton John’s Aida. From a dramaturgical standpoint, taking the history and placing it to modern music, the inconsistencies of musical styles made the overall feel confusing. Had the orchestrations been strictly “pop rock” and not moments of R&B, perhaps some of the songs would not have been completely jarring and out of place. 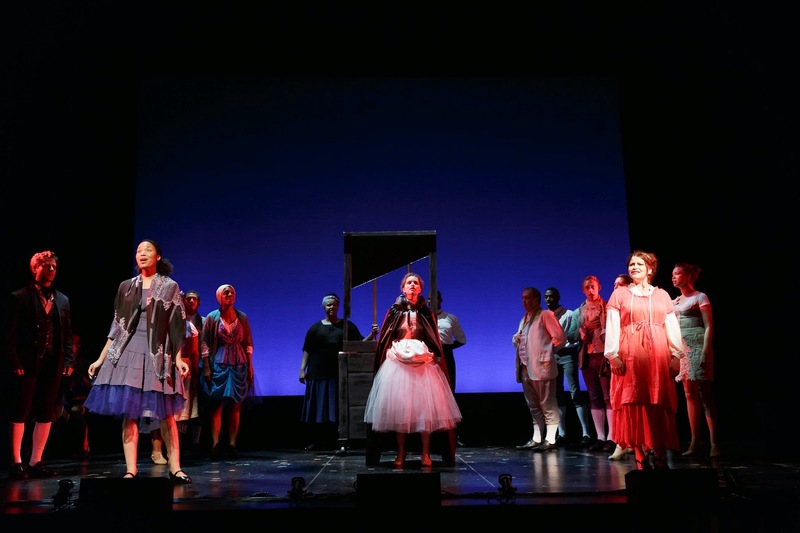 These random musical styles brought all the dramaturgical questions from the book to light. 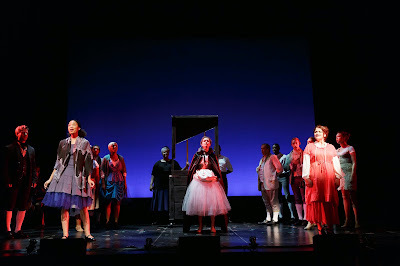 As Sally Hemings and Marie Antoinette respectively, Bashirrah Creswell and Brianna Carlson-Goodman were given the difficult task to bring these figures to life, the latter doing a much better job. Creswell’s Sally was quite monotonous and singular. Carlson-Goodman brought a newfound humanity to the French Queen you love to hate. As Madame Tussaud, Rachel Stern was a vocal powerhouse, giving Jones and Willis’ music a wonderful punch. Kevin Massey as Thomas Jefferson was charming, but given very little material to work with. Justin Johnston as James Hemings was unfortunately the musical alternative, and despite his heartfelt “I Dreamed”, it felt very much in the wrong piece. Doubling as Comtesse and Betty Hemings, Q Smith brought modernity and sass. Xalvador Tin-Bradbury was superb as the comic relief Count Mercy. Tin-Bradbury’s wit and expression was a true highlight of the piece, taking command in his role. The ensemble, for the most part was an odd mix of casting. There were many who seemed lost and did live up to the high standards the more seasoned veterans brought. With the orchestrations so grand and complicated they occasionally drowned out some of the weaker singers both in the ensemble and the main cast. As a director, maintaining the world of the play is essential. With the inconsistencies all over the place, Carlos Armesto had difficulty doing so. Some of Armesto’s stage pictures were captivating, but there is a more to theater than a pretty picture. By giving history a modern twist, uniformity in the worlds was key. However the accents were all over the place. Though they were intended to reflect the actors’ natural speaking voice, the inflections within the worlds were blurred. When only some of the royalty spoke with a heightened tone, it made some of the characters seem bizarre, like poor Jake Levitt as Louis XVI. Overall, Elisabetta Spuria’s choreography was entertaining, until “Revolution Song” when the recycled Les Miserable recycle march in place was used, unless that’s historically accurate. Shane Ballard’s modern blend in his period costumes were stunning. Madame Infamy is a piece with great potential. It is a piece that has a bright future. It is intellectually stimulating and a truly captivating story. But moving forward, consistency and accuracy will play an integral key in this musical’s success.